PWN: War, war is stupid and people are stupid…. Fair warning, on this edition of the Pagan Weekly News both RevKess and Zaracon get up on their soapboxes. Way up! War is a topic that no one really wants to talk about. Unfortunately it is the topic on a lot of people’s minds these days. In the United States, the Middle East, Russia, and elsewhere around the globe. Neither Zaracon nor RevKess have served in the military, but they know many people who have or are currently serving active duty. RevKess’s father served over seas during the Korean “Conflict” (War) and several of his nieces and nephews have been in the Middle East during the second Gulf War. War, conflict, strife. It all touches us somewhere and somehow. Whether we are at work, serve in the military, or know someone who is. It touches us all. Before diving into the meat and bones of the main topic for the show, Z and Kess spoke briefly about crowd sourcing and funding. Taylor Ellwood recently published an article on that very topic on the Agora for Patheos Pagan Channel. The Pagan-Musings Podcast Channel has been a big proponent of crowd sourcing and plans to continue to be so. Having helped with projects for Tuatha Dea, Brendan Myers, Frenchy and the Punk, The New Alexandrian Library, and many others. A note about the Israeli-Palestinian War: Heather Greene, columnist on The Wild Hunt and National Public Information Officer for Covenant of the Goddess, encouraged RevKess to reach out to Pagans in the Gaza area. Several false starts later he concluded that technology was not going to allow it to happen. Facebook messages and other attempts met with error messages and software failures. There are Pagans in that area and the hosts of PWN hope to be able to give them a voice in the near future. Call it a conflict, call it a war. The military shambles in the Gaza Strip have been going on for decades, if not centuries. Here are some links to articles that give background and current information on the war in the Israeli-Palestinian area. Wikipedia has an article on the History of the Israeli-Palestinian Conflict. Israel’s Prime Minister defends actions in Gaza during a peace summit is Cairo. John McLaughlin explains why the conflict in the area is different than it has ever been before – USA Today. Michael Cohen on The Guardian’s The Observer asks if the Israeli-Palestinian war is ever going to end. Even China has a peace proposal. Haaretz, an Israel media outlet, has live updates on the conflict. At the time of broadcast, this was the current article on the updates page. Since then the cease-fire has collapsed with serious effects on Gaza. NPR’s Morning Edition asks if there is any empathy left for the Israeli-Palestinian conflict. Iran sees some light at the end of the tunnel in regards to Gaza. Syria’s civil unrest is a four-point war. Obama authorizes air strikes in Iraq against ISIS/ISIL in defense of the isolated Kurdish religious sect Yazidi. The ancient religion is threatened with extermination by ISIL. NATO warns that Russia may be poised to invade. Canadian Prime Minster Harper announces intentions to send military and equipment aid to Ukraine. Included is a list of individuals and entities involved on the pro-Russian side that Canada is filing sanctions against. Russia bans the import of food from the United States and other Western countries as a reaction to imposed sanctions from the US and the European Union. Mortar round strikes a hospital in Eastern Ukraine, killing one. On July 29, 2014, the US Airforce approved Asatru and Heathen as a listed religious preferences for all personnel. This is thanks to Msgt Matt Walters the Open Halls Project, according to The Wild Hunt. Hellenic Polytheist, blogger and author Cara Schulz is running for City Council in Burnsville, MN. Peter Dybing eulogizes Margot Adler on his Pagan in Paradise blog. KaliSara and RevKess talk gem and crystal magick on this week’s edition of the Pagan-Musings Podcast. This topic was requested by listeners. Neither host is an expert in the field, but both have personal experience working with gems, crystals, stones, and metals (minerals) in their magickal practices. Listeners are encourage to suggest topics for the show. Listeners can also make recommendations for potential guests, or maybe even become guests themselves. Such suggestions can be made through the Facebook page for the show or through email. A 2013 revised addition is available. Selenite/Selenium: Sometimes called TV stone as it was used to make the screens of the older style tube TVs. “Selenite is a calm stone that instills deep peace and is excellent for meditation or spiritual work. Telepathy is enhanced by each person holding a piece of pure-vibration selenite.” [The Crystal Bible] RevKess mentioned during the show that he has used selenite to treat muscle issues in his back. Clear quartz: One of the most commonly found and used stones, quartz in its clear form is a universal stone. It can be used for healing, grounding, cleansing, psychic work and so much more. Clear or rose quartz can be placed on electronics to help balance the electromagnetic fields. Quartz, in its many variations, has 53 pages devoted to its uses and properties in Melody’s book. Lapis Lazuli: A dark blue stone with flecks of gold, lapis lazuli is perhaps most known for its use by the ancient Egyptians, the blue markings on the face of Tutankhamun’s funeral mask are inlays of lapis. Lapis resembles the night sky and perhaps is assoiciated with Nuit, Goddess of the night sky, and her Babylonian counterpart Ishtar. Lapis is RevKess’s “power stone”. Metals are also powerful tools for magick. According to The White Goddess website, there are seven noble metals that were used by the ancients. 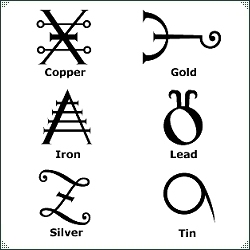 These metals are copper, iron, gold, silver, lead, tin, and electrum. The latter being a naturally occurring alloy of silver and gold and contains the properties of both. Copper: Use copper in rituals, spells and amulets to promote love, sensuality, friendship, positive relationships of any kind, negotiations and peace. Iron: Use Iron in rituals, spells and amulets to promote energy, strength, determination, will-power, assertivity and aggression, fertility-rites, beginnings and undertakings, speed, power and courage. Gold: Use the metal gold or the colour gold in rituals/spells concerning Sun-deities, the male force, authority, self-confidence, creativity, financial riches, investments, ,fortune, hope, worldly and magical power. Wear golden jewellery to improve self-confidence and inner strength. Silver: Use the metal or the colour silver in rituals, spells or talismans concerning Moon-goddesses, the female force, cycles, emotional and/or hormonal imbalances, reflecting or neutralizing negativity, dreams and intuition, psychic work and psychic abilities. Tin: Use Tin in rituals/spells promoting abundance, prosperity, success in business and in legal matters, stimulation, attracting what you desire, energy, healing, regeneration and rejuvenation.